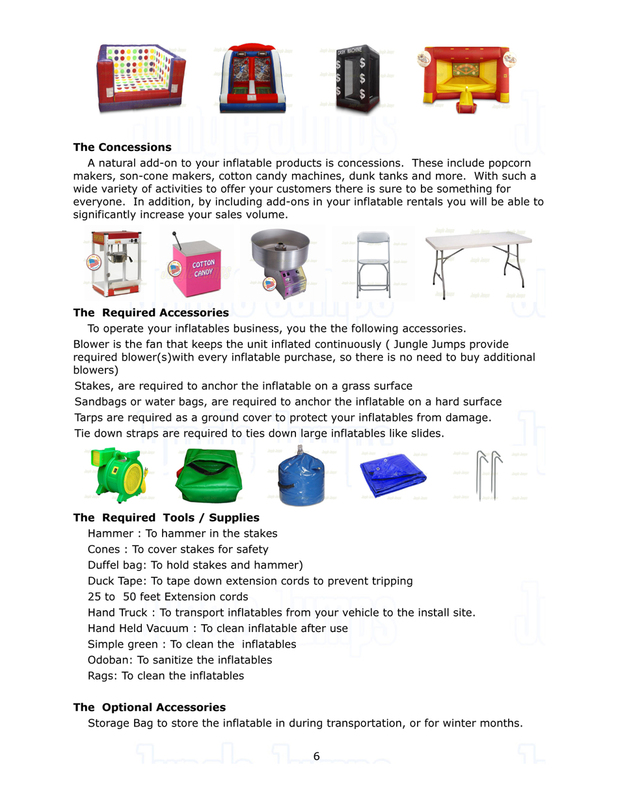 Odoban: To sanitize the inflatablesRags: To clean the inflatables The Optional Accessories Storage Bag to store the inflatable in during transportation, or for winter months. Deflator to deflate the inflatable in a quicker manner. Deflator attached to the blower. Exit and Entrance Mats are optional in some states and required in some States Part Two:Planning Your Business Business Start-Up RequirementsOf all the businesses that get started, many of them fail. Why do you think that is? The main reason is a lack of preparation. Some people just enter into business blindly. While others, know what they are doing and succeed.Starting a party rental business is about many things. One of those things is attitude. If you do not have the right attitude, you will not make it. Some entrepreneurs start their businesses out of necessity. Some start because they love what they do and started it as a hobby. They realized that money could be made in it, so they decided to take it professionally.Part-Time, Part-Time Going Full-Time or Full-TimeA business in the party event and rental industry can require as much of a time commitment as you are willing to put into it. Keep in mind that the cash generated from your business will also coincide with the amount of time you dedicate. One of the nice things about the party event and rental industry is that much of your work will occur on weekends. This means you have the option of keeping your day job while building your company and establishing clientele.Before starting your business it is a good idea to know what your ultimate goals will be. Will you start out part-time eventually moving over to full-time as the business and cash flow increase? Is your plan to just jump right in on a full-time basis and give 100% to establish your company? Or perhaps you are only looking for a part-time gig to generate additional cash on the side? Any of these can work for a business in the party event and rental industry. But this is something that you should know beforehand as you draw up your business plan.Market ResearchBefore taking the plunge, you have to do market research. You have to know if there is a need in your area. What is the sense in starting a business if there really is no need for it? This is where careful planning and research come together.You can’t just spend a day or a few days looking for everything. You have to really dig deep to learn everything you need to know in order to take the required steps. Sometimes, market research can take weeks to perform.As you do market research, you need to know what the costs would be to start the business. How much will you need to invest? Will you have to borrow? What does your family think about you starting the business? Will they support you? Will you have the time to run the business? There is a heavy responsibility with starting and running a business. You must have the mindset and the determination, because you will be working many hours. Do you have the stick-to-it attitude?